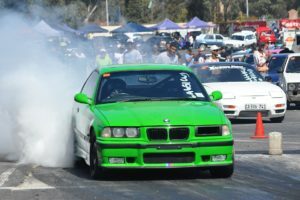 Round 2 of the Western Province Motor Club’s MSA Drag Racing championship at Killarney International Raceway on Saturday 30 March produced more than its fair share of drama and spectacle. 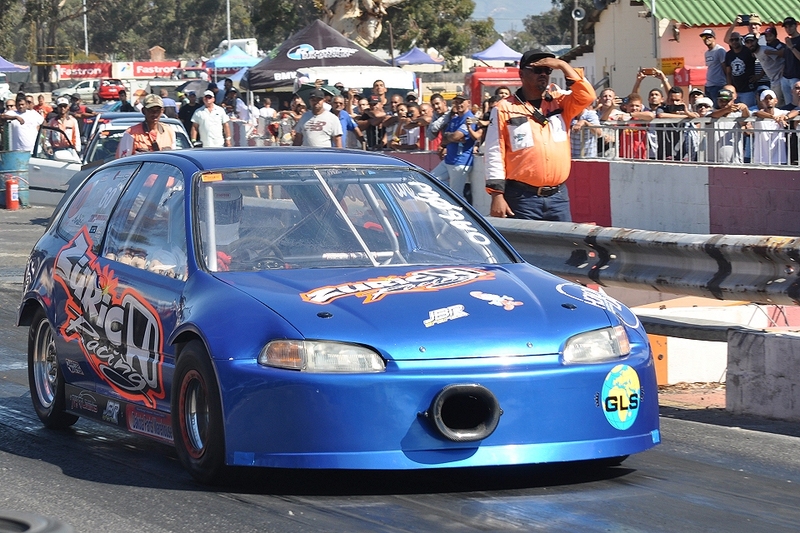 The fastest car on the day was Shaun Zurich’s Honda Civic – reputedly the quickest front-wheel drive car in South Africa despite running neither turbo nor nitrous oxide. Zurich laid down a stunning 9.536sec pass at 229.92km/h to win the open class for naturally aspirated cars. His was one of only two cars to break 10 seconds on the day – but more about that later. The motorcycles, as always, posted the most impressive numbers, with Abbas Brenner and Sharief Reynolds battling it out over four rounds in a Germany-versus-Japan shootout. 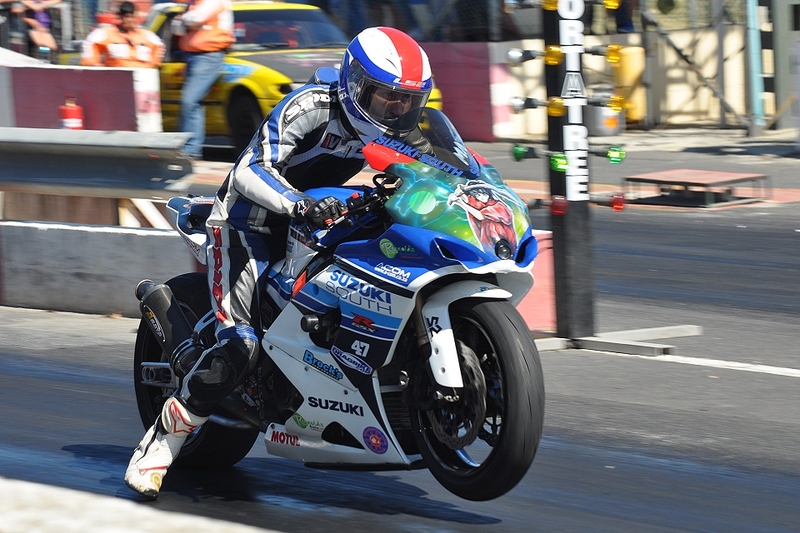 Brenner, riding Reece Roberts’ Buddy Racing S1000 RR, just shaded Reynolds’ Suzuki GSX-R1000, 8.872sec to 8.944 and 251.00km/h to 250.81 – it doesn’t get a lot closer than that. Achmat Achmat’s beautifully prepared BMW E36 M3 – the only competitor in Class 6A – disappointed on the day, however; the best he could do was a 12.545sec run at 181.32km/h. Brendan Parsons topped the open turbo Class OS with a blistering 10.142sec run at 219.74 in his front-wheel drive 1.8-litre Audi TT RS, while Alvin Rudolph in an Opel Kadett won Class 4A for naturally aspirated four-cylinder street cars with a 13.148sec pass at 161km/h. Class 4S for turbocharged four-cylinder street cars provided a graphic demonstration of the advantage conferred by all-wheel drive; the five quickest times were all laid down by Volkswagen Golf 7 Rs, led by Grant Steenveld with a 10.590sec run at 203.76km/h. No fewer than four cars broke half-shafts on the start line, and Parsons’ TT broke its fuel-pump drive – but the most spectacular mechanical failure of the day was the Nissan 200SX of Nawawee Dienie, which broke its bell-housing away from the block and was towed back to the pits with its gearbox and propshaft lying in the back of the tow truck – still oil-tight! Not so lucky was JP Peens, whose Volkswagen Polo TDi laid oil all the way down the left lane, stopping the action for almost half an hour while the marshals cleaned up his mess. The day ended in dramatic fashion when Rameez Ebrahim, having posted a superb 9.559sec pass at 218.10km/h earlier in the day to win Class 6S, suffered a complete brake failure on the magnificent jade-green RMZ Motorsport Audi TT RS and put it into the catch nets at almost 200km/h. It destroyed the first of the three catch nets but none of the anchor poles let go and the car was stopped by the second net without injury to Ebrahim and with remarkably little damage apart from the front bumper, bonnet and windscreen, all deeply imprinted by the netting. The car was rolled out of the way on its own wheels to await recovery by its crew but the stewards decided not to continue racing with only two catch nets. If nothing else, Ebrahim’s crash was dramatic proof that the catch nets work exactly as they’re intended to.